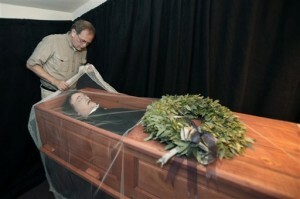 The late Edgar Allan Poe had a memorial service Sunday, October 11, in Baltimore, Maryland. Yes, that late Edgar Allan Poe—the beloved American writer of the macabre who has been dead for 160 years. Hundreds of mourners in period dress, including Alfred Hitchcock and H.P. Lovecraft impersonators, paid their respects to the man whose first funeral, following his mysterious death in 1849, fetched only a handful of attendees. The memorial service Sunday — there were two, actually, to accommodate all the mourners — was one of many events celebrating his 200th birthday. To see some footage of the Poe replica and procession, including some retro morphing effects in the ABC video, check out the links below (it seems to be popular lately to disable embedded video… jerks). At the beginning of the ABC video, I twice saw an ad for a mouse trap — count yourself lucky if you watch it, too: “Nothing to see, nothing to touch, you just throw it away.” …Because that’s just how we like our death: disposable. Posted by Meg Holle in Burial, Monuments + Memorials and tagged celebrity death, funerals, memorializing. Bookmark the permalink.